The CD above is not a new release. The performers on it are not notably young. It is not new music. The composer does not have an anniversary. It has not recently won an award. But do read on. 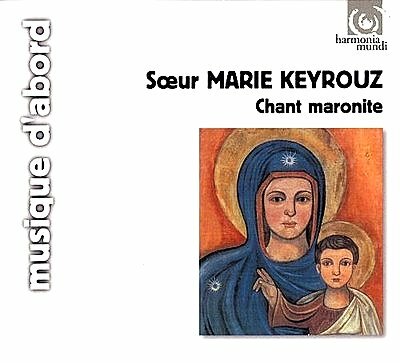 The disc of Maronite and Syrian chants is sung by the nun with the selling habit, Sister Marie Keyrouz, and accompanying choristers. It was recorded by Harmonia Mundi in L'église évangélique allemande in Paris in 1990. Traditionally these chants, which have their origins in early Christianity, are sung unaccompanied; the exception is on important days in the Christian calendar, when they are augmented by a limited range of metallic percussion. However, this disc follows the more recent practice of adding complementary instruments. The addition of L'Ensemble de la Paix (who are actually Sister Marie's backing band) playing nay, oud, quanoun and percussion, lifts the CD from being a fascinating document of a sacred tradition to a very accessible and enjoyable early music disc with a uniquely Middle Eastern sound. HMV are currently offering it online for £4.99 delivered in the UK. Does it really matter if it is not a new release ......? Or that there are none of the tricks of modern music? I bought the CD when it first came out in 1990.Thank the Lord for Harmonia Mundi. That being said, it would be nice to see any of the ARCHIV recordings of Eastern Orthodox music reissued, whether its from Mount Athos, or the Zagorsk Monastery. Alas, we may never see those again. It is a fair point you raise. I was actually involved professionally with print on demand in its early days. Like you I was very nervous about ordering the Mount Athos book because of the technology used to print it. But, I have to say, the quality is probably better than a conventionally printed book. Maybe I got lucky. But that book resides on the shelf where I keep 'treasured' volumes. Not many go there. love her, have this and all of her available recordings.Gorgeous.